The musical story of a nine year old runaway orphaned child who joins Fagin's gang of young London pickpockets, before being united with his wealthy uncle. Carol Reed (who also won the Oscar for direction). With Shani Wallis, Mark Lester, Harry Secombe, Hugh Griffith, and Shelia White. Sir John Woolf (1913 - ) British producer, who with his brother James founded Romulus Films in 1949. Together they were involved with: THE AFRICAN QUEEN, MOULIN ROUGE, and ROOM AT THE TOP. John Woolf's other works include: DAY OF THE JACKAL and THE ODESSA FILE. John Box, Terence Marsh, Vernon Dixon, and Ken Muggleston received their Oscars for Art Direction/Set Decoration. While John Green was awarded the Oscar for Best Music (Musical-original or adaptation). The Shepperton Studio Sound Department received the Best Sound Oscar. Onna White won a Special Award for her choreography. 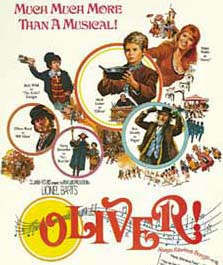 Based on the successful London and Broadway musical, which owed its inspiration to "Oliver Twist" by Charles Dickens.